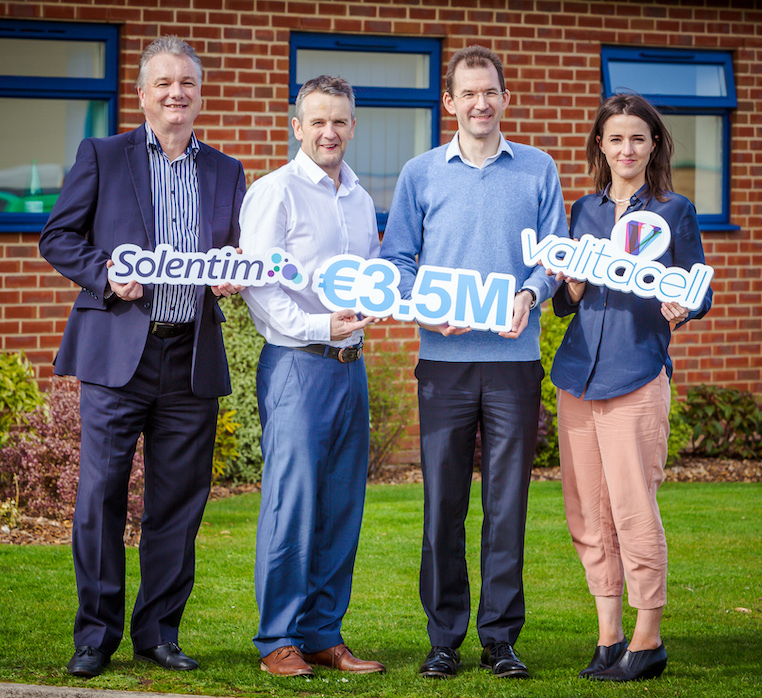 Bournemouth, UK and Dublin, Ireland, 27th March 2019 / Sciad Newswire / Solentim and Valitacell announce a total of €3.5m funding to produce an integrated platform to deposit, culture, profile and select optimal cells for the manufacture of life-saving biological medicines. Building on the existing partnership between Valitacell and Solentim announced in February 2019, Microcoat Biotechnologies GmbH has joined the consortium to further strengthen manufacturing capability and scale. Over the next 24 months Valitacell’s novel platform technology, Valita®PIX, along with Solentim’s proprietary instrumentation, will be deployed to create a unique system enabling the automation of data-driven analysis and selection of top clones during the biologic drug manufacturing process. The new platform technology comprises a hardware component enabling precision sample preparation, on-board imaging and sample tracking of clones and cell samples. When combined with a novel plate consumable, this technology will significantly improve ranking and selection of top clones for manufacturing. Selecting clones earlier will speed time to market, creating cost savings and ultimately accelerating access for patients to new medicines. “We are delighted to be working with Valitacell on this exciting collaboration. Valitacell’s novel assay plate technology enables determination of clone productivity in the cloning plates themselves. Previously, the removal of precious sample volume from the cloning plates for off-line analytics has largely been prohibitive. This novel technology negates the need to remove samples and, uniquely, facilitates an in-line measurement”, commented Dr Ian Taylor, Chief Commercial Officer of Solentim. “This complements our objective of creating a complete suite of products for cell line development, providing a simple turnkey solution for customers from transfection to early selection of best manufacturing clones based on their critical quality attributes”, added Dr Taylor. The Fast Track to Innovation (FTI) is part of the EU Horizon 2020 programme and provides funding for close-to-market innovation activities in technology. The funding aims to reduce the time from idea to market and promote close-to-the-market innovation activities open to industry-driven consortia. Valitacell is an Irish based biotechnology company accelerating the development of life-saving medicines with a suite of novel, intelligent analytical technology platforms, engineered to provide process control in cell-based manufacturing to achieve the highest levels of bioprocess performance. This is Valitacell’s second success in the H2020 programme. The company was awarded €2.03 million in funding through the H2020 SME Programme for European Innovation in 2017. In 2016 Valitacell was the overall winner of the InterTrade Ireland Seedcorn Award. Visit www.valitacell.com for more information. Solentim is the global leader in enabling accelerated cell line development for new biologic drugs through its proprietary intelligent automation. Solentim’s portfolio of products (VIPS™, Cell Metric® and Cell Metric® CLD) enables customers to establish a simple to use and completely integrated workflow, revolutionising single cell cloning and providing documented daily whole well image assurance of monoclonality for FDA and other regulatory bodies. Solentim works with most of the world’s top 10 pharmaceutical companies and has a customer installed base of several hundred instruments. It also has established strategic partnerships with ATUM and Valitacell. In 2018, Solentim was the recipient of two highly prestigious Queen’s Awards and named in the Deloitte UK Technology Fast 50. Visit www.solentim.com for more information. Microcoat Biotechnologie GmbH is a growing and future-oriented biotech company based in Germany near Munich with over two decades of experience in diagnostic testing, kit manufacturing and coating of microplates and other test formats. Microcoat offers a wide range of individual and specialized services for the diagnostic and pharmaceutical industry. Visit www.microcoat.de for more information.